Despite the term being heavily abused in the media, geopolitics is a distinct discipline with clear definition. Geopolitics is a lens for interpreting world events, a tool for separating at least a little bit of personal bias and emotion from our interpretation of the world by modeling it as a physical system where aggregate human action is constrained by geographical factors. The geography a group of humans inhabits dictates a few imperatives on the group that must be satisfied if the group is to be successful relative to other groups. This version of geopolitics is “pure” and often leaves out the social aspect of human interaction. Of course, culture can play such a huge role that I occasionally step outside of pure geopolitics and extend to socio-geopolitics, but generally speaking the “geo” part of the term is the dominant factor. Interpreting the world from a geopolitical perspective can be emotionally painful or shocking at first. That isn’t hyperbole. It can actually be so disturbing that many people who are initially interested in “how the world really works” run screaming from the first few lessons with an experienced mentor. Your political biases will get eaten wholesale, much of what you believe to be true about the world will be overturned, your sense of personal morality will find itself under constant attack (as individual morality can never be effectively applied to large groups), many of your unconsidered assumptions may turn out to be totally false on closer examination, etc. It can be deeply disturbing, even terrifying, for people whose views are heavily shaped by ideology. Have strong feelings about Marxism? Capitalism? Abortion? Religion? Some particularly divine or truly vile historical figure? A favorite period of history? A favorite culture? A favored artifact of technology or warfare or art? A favorite language? A favorite style of cuisine? Lifestyle? Sexual preference? Religiously informed political view? Geopolitics will eat your babies and murder your friends before it finally turns on you and leaves you feeling that everything your moral compass was based on is a fabrication. That is, of course, until you get reoriented and realize that none of what was destroyed mattered — because it was all mistaken models of how the world works based on limited information, the missing parts of which you filled in by projecting your personal sense of individual morality on governments, national groups, companies, tribes, periods of history where the moral compass may have pointed a totally different direction, and so on. You were imagining the world as it should be instead of how it actually is, and snapping out of that is the shocking part. You don’t have to be changed by geopolitics, nor do your views about individual right and wrong. Your views about governmental right and wrong will definitely change, though, and perhaps most importantly, you will come to realize that the publicly touted reasons for many events are exactly backwards. All of this can be at odds with personal views to which you may discover you have developed a profound emotional attachment, and letting go of emotional attachments is uncomfortable for a reason. Cause and effect are often reversed in public discourse. Sometimes it is a deliberate trick of rhetoric, but for the most part it is just how people recall and justify events after the fact, especially when they don’t have time to really dig into the details. Today we are going to take a closer look at that phenomenon I mentioned above: geographical imperatives and how the laws of physics and the unwritten rules of human behavior conspire to force them on groups of humans. Most nations have impossibly difficult sets of imperatives, or imperatives that are difficult to establish clear priority order for or sometimes even discover without an in-depth investigation. Sometimes a group of humans itself doesn’t even a coherent body, which obviously confuses things a bit. I’ll hit the low hanging fruit as an exploratory exercise today and examine the most well-known case in the world: the geopolitical imperatives of the United States of America. This thing below is called a map. They are really, really important if you want to understand why governments do pretty much anything on the strategic level. Low-res image compliments of Wikimedia Commons user Martin23230. There are many kinds of maps. This is a simple orthographic projection of one side of the Earth that shows some of the major political boundaries and none of the terrain other than separating the always-dry bits from the always-wet bits. That’s not very useful for many kinds of analysis, but this kind of simplification is really useful for understanding relative distances at a glance. Our emotional attachment to particular issues tends to cause some distortion in our recollection of the map and particularly our memory of adjacent nations, the exact location of major waterways, the distance between significant points, and especially the details of the terrain involved that may have a profound effect on how a strategist will interpret the map based on how difficult it is to engage in a given activity in a given area. As an example, I can’t remember how many times people have asked me about bizarre 9/11 or Afghan War conspiracy theories, the underlying premise of the theory being that they feel certain the U.S. military could absolutely flood Afghanistan with soldiers and war matériel if the need arose by using the USAF’s tremendous fleet of cargo craft. It is hard to illustrate the sheer scale of how wrong this is. 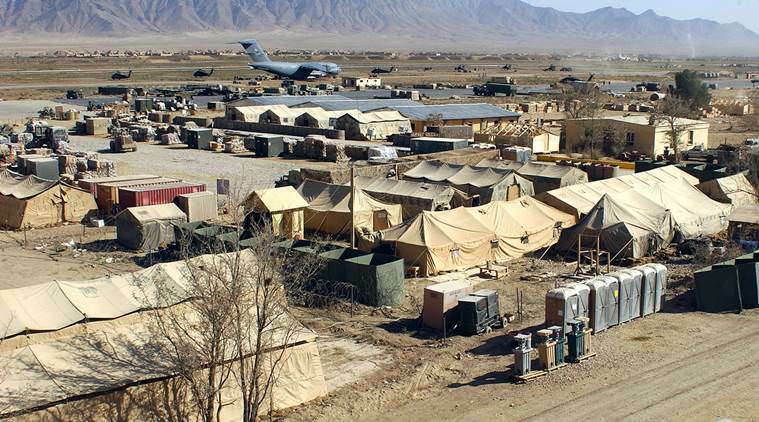 The USAF does not have nearly enough airplanes to lift the daily tonnage of logistical support supplies necessary to run the Afghan campaign. It is truly mind-boggling how much stuff goes into a campaign of that scale and how much logistical support the operations involved require. Is the campaign dramatically bloated for the actual impact it has? Yes, definitely, but it isn’t 10x bloated. Maybe double or triple, but not bloated by a factor of 10. To support the Afghan campaign by air would require that it be reduced by about 100 times at the very least. I forget the figures right now, but we actually ran a calculation like this a few years ago and it came out to something between 100 and 1000 times shrinkage would be required to support the campaign by air alone. Why so many trade-offs in the Afghan campaign? Why is this so hard? Afghanistan is a very high altitude, landlocked buffer zone surrounded by buffer zones. The roadways are limited, there is extremely limited internal rail support, and no ocean access at all (so no heavy shipping). The maximum lifting capacity of a C-17 is about 70 metric tons and a little less than 70 or so are available to the government at any given time (of about 200 total in the military system). That still sounds like a lot of lifting capacity, and it is! Relatively speaking. Compare that to 10 to 20 tons of capacity in a typical shipping container multiplied by a typical capacity ranging from 5,000 to 15,000 containers per ship when you have ocean access. Nope. Trying to support an entire heavy-presence military operation with air supply alone is a non-starter. Keep that in the back of your mind. Logistics drives just about everything, and logistics is a super hard problem humanity has not come anywhere close to solving yet (sort of like computer security…). That’s it in all its cold, calculated magnificence. As lists of national imperatives go this is one of the shortest and most inherently achievable lists in the short history of geopolitical analysis. Quite remarkable, actually. In light of recent political insanity and media hyperbole please, let’s take a moment to consider what is not not that list. No mention of race. No mention of immigration. No mention of education reforms or welfare programs or any other form of social assistance programs. No mention of slavery. No mention of “social safety nets”. No age of consent. No duty to uphold the sanctity of homosexual marriage unions within the non-CIS-but-genderqueer branch of the pony community. No requirement that the government spy on everyone. No requirement that the government not spy on anyone. No mention of monogamy or polygamy or asexuality. No mention of baby murder VS women’s health. No preference for one religion over another. No mention of FOSS vs closed source. No promotion of atheism. No stance on narcotics enforcement. No mention of net neutrality. No mandate that women get the vote. None of that stuff. Why? Aren’t these pivotal issues? Well, not really, no. The physical laws that made this particular geography come to be do not care about any of those things. In fact, they don’t care, period. Concern for your preferences is not a rule of the universe. At this initial level of evaluation we are considering these issues in isolation of all the other stuff. There is an order in which geopolitical study of a region must be conducted or else we will find ourselves hung up on this or that favorite issue and miss the forest for the trees. We must consider the terrain first (its shape, what is in it, what resources are available, climate, terrain, lines of drift, proximity to other key terrain, etc. ), then the existing infrastructure, then the existing and demonstrated capacity of the inhabitants, then the disposition of the available resources within the area, then a similar study of the adjacent areas, then gaming out a regional set of possibilities, etc. We won’t get into a detailed analysis here (which involves using numeric techniques to try to discover at least some of the bias in our assumptions), but we will touch on each of the elements in a cursory way while assessing the imperatives discussed below. Of course, once you go through the process once you iterate over it again and again — any time you learn anything new that might be significant. Note that I haven’t mentioned anything about the details of culture or the nature of a given nation or people. At the outset we must look at the group that inhabits a given terrain in abstract: they have no race, names, history, culture, language — nothing. We don’t know who they are yet because we aren’t considering them as actual people yet, just hypothetical inhabitants. Remember that while each issue may be very important to a given individual none of them are important from the much higher level of geopolitics. From a strategic perspective these cultural and personal aspects are distractions, issues that only rarely become geopolitically significant by themselves. While certain cultures have proven over time to be remarkably more robust and effective than others, past success does not necessarily predict future success. The problem lies with the nature of “success” and “failure”. Most people are destined for failure. Most organizations are not very organized. One team doesn’t typically win because it is so squared away as much as their rivals are just so screwed up that it is a wonder they even stick together (and often they don’t — consider the fractures that surfaced in Libya when Qaddafi died). There isn’t anything stopping any pack of historical losers from flipping the switch and getting organized and engaged one day. We cannot assume that just because some particular collection of people has failed in the past it can’t — perhaps as a result of a radical change in leadership or cultural mores — suddenly start to flourish, and obviously the inverse is true as well. This is a critical point to understand because economics is not a zero-sum game, failure is always an option, and generation is a lot slower and more input-intensive than destruction (which is why violence and appeasement go together so well). Geography stays the way it is for a long time. The world of men surges and ebbs and gets all mixed around at a breathtaking pace. Our interpretation of a map is grounded in the practical aspects of the logistical capabilities and resource technologies of the day. Before the invention of the maritime clock and reliable long-range maritime navigation, maps had intensely inaccurate coastlines and bloated interiors swelled to the edge of the page, chock full of details describing and naming what could be found on land and where. The oceans were relegated to the edges and shown as bleak and frightening aquatic wastelands full of monsters and giant serpents. Today we regard such maps as cartographic oddities, laughable and charming in their blatant inaccuracies — unless you actually grab a sea map and try to use it to walk somewhere without an accurate compass in hand. The bloated and “inaccurate” interiors were so bloated and detailed because they were full of next-hill landmark data, crucial for navigating by land back in the era they were drawn. After the advent of blue-water navigation coastlines on maps became radically more accurate an displayed interiors became less detailed which corresponded with them suddenly becoming less geopolitically significant. A radical change in resource utilization (invention of the internal combustion engine or lithium battery, for example) or a radical change in heavy logistical technology (reliable maritime navigation, advent of the cargo airplane, development of the nuclear ballistic missile submarine, or commercially viable space shipping) is the kind of technological change required to change our interpretation of geography. Those changes occur so slowly that we usually see them coming and we mark eras by them: “The Golden Age of Sail” or “The Space Age“, etc. The nature of human societies changes at a pace that is imperceptible when you are young and requires study to even catch on to, but feels blindingly fast when one’s own life is reflected upon in hindsight. In fact, this is one of the chief lessons of history. So we leave out the particulars of the type of people or their cultural details and focus instead on the facts of geography and the practicality of the technology of the era in pure geopolitical assessment and analysis, and only dig into the cultural mess when conducting socio-geopolitical assessment. One note of warning here: communication technologies not regarded as geopolitically significant. I can hear it now: “Why not? People can talk to each other instantly today! Since all violence begins with misunderstanding clearly communication technology will bring everyone together and produce world peace ™ and that will certainly be geopolitically significant!” Oh, where to begin. First off, does it seem like the world is becoming more polarized or more unified now that we can all scream at each other about every little detail of our lives? Clearly, in the days of ISIS, renewed violent political agitation in the West, and an EU council that doubles down on a catastrophic immigration policy “misunderstanding” is not the root of conflict. Perhaps knowing too many unpleasant realities about the people next door is, though. It’s a tough one to figure out, really — but one we don’t have to care much about when viewing the world with an eye to geopolitics, because anger isn’t what drives nations, imperatives are. To actually do anything anywhere you have to actually get there and that means logistics always trumps communication. In fact, even critical business decisions today still travel at the pace of a man. (And yes, that is a gendered noun. I’m really courting controversy these days!) Why did it take roughly a week between the Russian invasion of Georgia in 2008 and the collapse of the European markets? Because it took about that long for people to make a concrete assessment of the event and the logistical and military threat that was posed to the profoundly overextended Yen carry-trade in Eastern Europe. This investigation did not involve a couple of Skype calls or Tweets or whatever — it required travel and personal meetings before final decisions were rendered. You don’t simply make a trillion-dollar decision based on a segment you see on TV one day. You don’t build a strategically significant aircraft factory in France without sending people to actually see the site with the Mark 1 Model 0 eyeball and report back. All this activity hinges on logistical technology. In the past checking the situation in East Europe would have taken a month, not a week, and an American or Japanese inspecting a new factory site in France would have taken several months to a year — and it wouldn’t have mattered much whether they could have Tweeted about it the whole time or not. Occasionally a constellation of issues does arrange itself in a special way so that they have a socio-geopolitical impact in aggregate — but evaluating this is much more subjective (meaning, subject to personal bias and therefore much less reliable), even though occasionally such analysis really is warranted. It bears mentioning that any effort at socio-geopolitical assessment (technically not “analysis”) can only be performed after a geopolitical analysis has been performed because socio-geopolitics is more complex, and the complex always leverages the underlying simpler, pure analysis. With all that in mind, let’s run through the various imperatives and see what we find. We are only going to think through what these different imperatives mean and how they have impacted history a bit, not actually engage in an exhaustive analysis — as that would entail bringing the context of a given point in time into play. This article is already over-long for a blog post as-is. The first imperative itself is unique among the others. It is the only one that implies anything about domestic politics. While it does carry some implications, an implication is not a specification. Geography dictates that Washington must delegate political control downward as much as possible. This doesn’t tell us how a government should work or how power should be wielded domestically or whether women should get the vote or whatever other detail, but it does indicate that large central government programs will always tend to exist in opposition to American strategic interests. It doesn’t tell us anything about how that should manifest, it is simply the fact that inefficiency is part of the nature of large organizations because large organizations grow exponentially complex and complexity is the enemy of both efficient operations and effective leadership. Central administration of a territory and population as large as the United States would require an absolutely massive and profoundly complex central government — and keeping such a government running would be simply impossible. It is important to note here that the rest of the imperatives are set in conflict with this to some degree because a central authority is clearly necessary to pursue most of the imperatives that follow. So here is the first problem any polity based in the American geography must solve: How to create a durable political structure that can endure attempts at organizational corruption over several generations while maintaining a balance between delegation of civil authority and retention of central control of military and political action internationally? Not surprisingly, the Constitution was written in an attempt to achieve exactly this kind of balance. Hands-off domestic policy from the central government, but strict subordination of the state and local governments (and, in a time of war, resources) to the central government in international affairs. The Constitution was written to protect the first imperative and establish a system by which a central authority can be created that is capable of pursuing the rest of the imperatives. 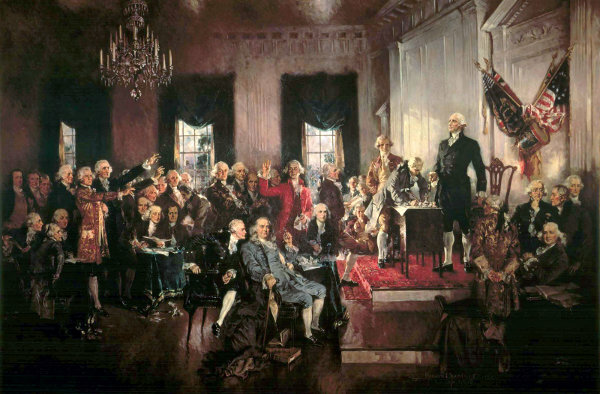 Mythos aside, the U.S. Constitution is not a document that enshrines brotherly love, freedom, state independence, or civil liberty for their own sake. It is a sober document that describes a system of government that might give the United States a shot at real world power and prevent politicians from derailing that rise to power once some minor level of temporary success had been achieved. Why have this split between civil and international authorities? Because the American geography, while having excellent natural lines of drift for navigation and logistical operations, is incredibly diverse and inhabited by a series of populations that all arrived from somewhere else. The culture of each state will inevitably be a little different. The moral standards in each community are therefore different. Expected anchors of social loyalty are different everywhere you go. The primary focus of economic activity changes from locale to locale. And all of that is a good thing. This is the real meaning of having useful diversity. It is just way too complex to administer centrally. To understand how that is unique and what it means, let’s compare with two counterexamples: Singapore and Russia. Singapore is small enough to administer centrally. This is, of course, a somewhat unique example, but it is a useful exercise to think carefully through why Singaporean style civil law would not work if applied uniformly across the entire United States. It is also interesting to consider how Sinagpore’s unique strategic military and economic position in the world are able to leave it with enough resource to even engage in the game of central domestic control. The next six American geopolitical imperatives are all quite different from the first. The second through seventh are what I call “imperatives of achievement”. They are clear goals that can be achieved and considered “complete”. This makes formulation of a strategy for achieving them and recognizing moments of special opportunity that apply to any of them much more straightforward than trying to figure out a way to accomplish either the first or the last imperative. With imperatives of achievement a glance at a map tends to make the reason both for their central importance and their order of priority clear. It is worth mentioning that it is no surprise that the first and last of the American geopolitical imperatives are different from the ones in the middle. The first task in assessing a nation’s circumstance is to determine what system governance best suits the terrain and culture, the next step is to figure out what things that government needs to achieve to secure primacy in its part of the world, and the last task is devise a strategy for how a nation can most effectively safeguard its achievements at the lowest ongoing cost to itself. If the first imperative is out of alignment with reality then it is a useful indicator that severe misalignments or imbalances in the nation’s power structure can be found. On the point of misalignments between the chosen political strategy and the terrain, China has been a great example of that every time its separate inner kingdoms have been united under a single body that attempts to rule over them with the same level of strict central authority which which each sub-region has been historically ruled. That is the situation right now, actually. At the very high level, China’s terrain suits a federalized, delegated style government better than an authoritarian, centralized one, and it appears indeed that China is actually closer to facing a massive economic collapse due to the influence of this misalignment rather than becoming capable of sustaining credible power projection overseas. In view of the prevailing Chinese culture throughout history, that this is a theme in Chinese history comes as no surprise. It is actually quite possible that due to changes in lifestyle and life expectations among Chinese that the next version of China may wind up looking more like the American federal model than the current centralized Chinese. As an individual who believes that would be great for both Chinese people and the countries I have a personal interest in I can certainly hope that this is true or even believe that it should be true, but as a geopolitical thinker I am only permitted to assess this as a possibility and settle with a dispassionate “time will tell”. It is worth mentioning here that so far no combination of political structure, culture, technology and strategy have ever come close to predicting any possibility of stable governance over the entire world at once. Until we are quite far into the spacefaring future it is simply an impossible goal. Not just improbable, actually impossible. That is why you will never encounter a set of rational geopolitical imperatives of achievement that include “establish total world political dominance”. That is the sort of fantastical thing that pan-national socialists, ethnic supremacists and Dr. Evil fantasize about, but it just isn’t in the cards for the foreseeable future. Geopolitical imperatives tend to have a natural way of petering out at some limit that is itself dictated by the geography and circumstance at hand. The limit is not always obvious, but it usually is. Making the East Coast unprofitable to attack is not the same as making the East Cost impossible to attack. The British discovered that letting go of the Americas is a lot more profitable than trying to hold on and control it directly. As long as the balance of benefits is negative Washington has nothing to worry about, even if all it controls directly is the Eastern Seaboard. As long as this is true Mexico and Canada also cease to be threats. Despite being directly adjacent, neither Mexico nor Canada has anywhere near as good a geographic base from which to support the kind of economy necessary to field a military that would pose a threat to the existence of the United States without extremely heavy support from an external sponsor. As just established, such support would not be worth the eventual outcome. With the East fully secured, the rest of the continent opens up, either to immediate takeover or to gradual colonization. It doesn’t really matter because the East is the key to meaningful control of the Mississippi Drainage Basin. Even if another power were to control the entire Louisiana Purchase, Washington could choke off its access to international waters and contain its international influence to the Gulf of Mexico at a very low cost in terms of naval investment. Using the now fully secure Eastern Seaboard to support an effort to capture and control the middle of the continent predicts an inevitable need to also control the West Coast, both as a buffer beyond the Rocky Mountains (though the Rockies do provide a nice barrier themselves) and as a way of accessing the Pacific Ocean to become an influential power in both sides of the other hemisphere. With territorial integrity secured from coast to coast the U.S. enjoys a position no other country can match: it has the entire Pacific and Atlantic Oceans as its buffers. Typically speaking, oceanic buffers require dramatically less political maintenance than territorial buffers do. The period in which the U.S. expanded its control westward was a fascinating period, a roughly 200 year span chock full of all kinds of things people seem to forget are integral to human behavior: indigenous ancillary military operations, public/private contract military forces, imperatives being justified by invented rhetoric, corporate assassinations, anti-immigration political platforms, “No Country for Old Men” problems, Game of Thrones level intrigue, Thomas Jefferson violating his own principles of government in the interest of leapfrogging almost an entire imperative in just two strokes (the Lewis & Clark Expedition and the Louisiana Purchase), actual swashbuckling pirates mixed up in serious national efforts, etc. Study of this period has become heavily politicized for a number of reasons, but like it or not there was simply no other way things could have gone and the world to have ended up with the United States of today. If you think a world without the United States would have been better in some way, consider what would have come of your current ideals (or if you would even exist to hold your current ideals) had the Crown, the Nazis, the Soviets, the Spanish or even the Aztecs secured hegemony over the Western Hemisphere. The geography dictates that someone would have eventually established hegemony over the Americas, and that nation would be one of an only possible three superpowers in the modern era. The U.S. doesn’t sound so awful considering the alternatives — but then again, we are not allowed to care about what should be, only what actually was and is and possibly may be. In any case, it doesn’t matter who was in charge in the East (there is even a possibility it could have been a more autonomous European colony at the time of the expansion), projecting our biases into the past onto historical figures who could never have imagined our current political, emotional and personal biases today is a pointless exercise. None of that gets us any closer to understanding the world the way it actually was or how the version of the world that our history passed through back then became the version of the world it is right now. So stay away from that. Remain interested in history for its own sake and you might just learn more about what happened in the past and come to understand something more about yourself in the process. The enormous power of the central United States in terms of agriculture and economic output is all just wasted potential with no way to effectively recruit it if the heavy transit routes down the Mississippi and Missouri Rivers do not connect to a secure passage to the open ocean beyond the Gulf of Mexico. This is even true when it comes to shipping heavy things (or a large volume of light weight things) from the center of the United States to the coasts (particularly true before the advent of transcontinental railroads and interstate highway system), hence the central importance of the riverboat culture Mark Twain wrote about. From the late 1700’s to today the river country has been critical to nearly everything the U.S. does that has a strategic impact. 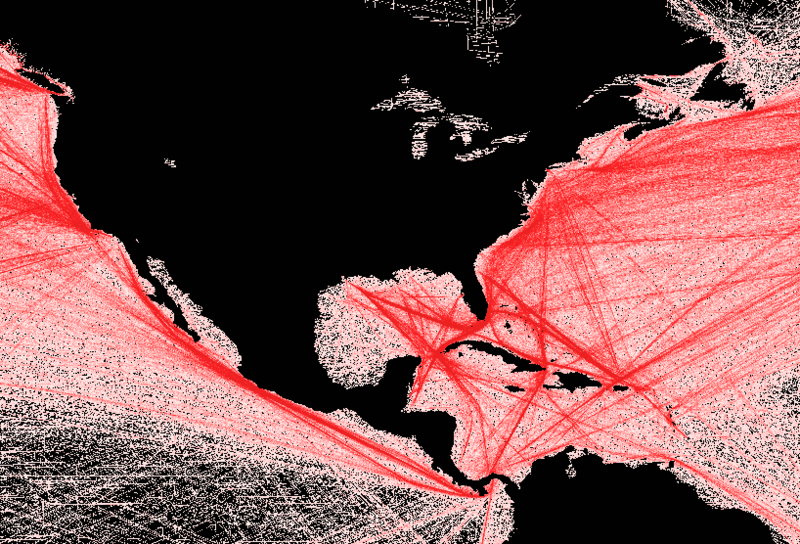 A heat map of shipping lanes through the Caribbean. (Derived from an image by Wikimedia user Grollech.) Compare again with the map of the Mississippi Drainage Basin above to see how much of the country’s power is bottlenecked first at New Orleans and then either the northern coast or western tip of Cuba. 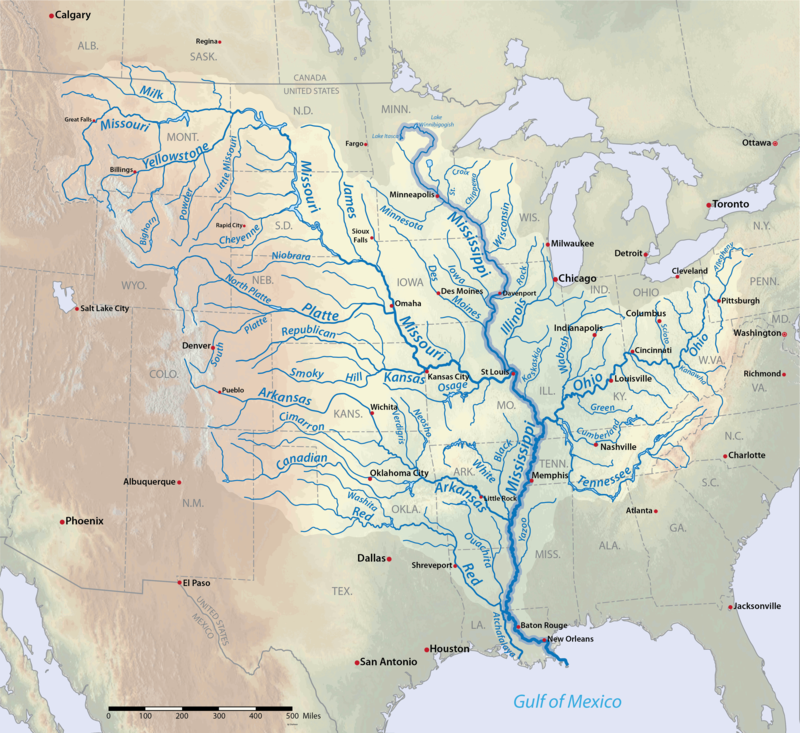 While the Louisiana Purchase went a long way to securing imperative #3 by acquiring the Mississippi Drainage Basin from a cash-strapped France, the importance of that achievement can never be fully realized until routes from New Orleans to the rest of the world are secured through the Caribbean. As you can imagine from the enormous American shipping activity surrounding Cuba, strategic analysts tend to think of Cuba as a cork sitting half-way in the bottle of American commercial power. That is why the U.S. has had a seemingly weird obsession with Cuba over the last two centuries, why the Spanish American War was inevitable, why Soviets found it absolutely mandatory to screw the place up, and why even today Moscow sends high-profile air and naval missions to the island. Much like the Strait of Hormuz, the mere threat of militarizing the waters around Cuba would cause a market panic that would ripple the world over and hurt just about everybody in some way. The calculus of any spoiling naval play around Cuba comes out in whether the harm done to the attacker would be small enough relative to the harm done to the American-led system to be worth it — and the solution to that is always entirely context dependent (so far it has never been quite worth it to go totally overt against the U.S. in this region, as clearly demonstrated in the Cuban Missile Crisis). For the most part this balance has worked out in Washington’s favor, but not to the extent that the Soviets stayed entirely away. It is no accident that Che Guevara‘s movement was sponsored by the Soviets and that Fidel Castro‘s Cuba was quickly re-evaluated by Moscow (which initially distrusted him, thinking he was a CIA plant) which was looking for a way to distract the Americans closer to their own territory. Their movement evolved, as these things tend to do, from a passionate individual fight against political oppression to a fight for the title of Supreme Oppressor — a position that cares little for preservation of liberty, freedom, equality, egalitarianism, Marxist principles, or even anti-Americanism. They were indigenous leaders useful to the cause of undermining American hegemony in order to buy the Soviets breathing room elsewhere on the globe and were reshaped that way by a vastly superior outside power. The Americans had major tank and missile forces stationed a mere 2,000km from downtown Moscow — it was unthinkable to the Soviets that they could not at least support a strategic distraction equally close to the American heartland. It would not have mattered if their political rhetoric was initially based on Communism, Anarchism or Pastafarianism; the Soviets needed to make a spoiling move in the game somewhere and indigenous leaders would have been found to run the show. The Monroe Doctrine is often cited by folks who seem to have never read it or understood the context in which it was delivered. It is often mistaken for a document that mandates Washington “meddle” in South American internal affairs. This is not accurate. 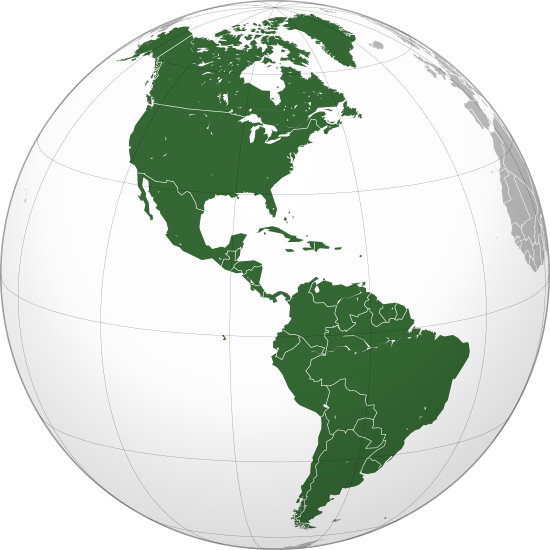 The Monroe Doctrine states that Washington will actively resist the efforts of non-Americans powers to meddle in South American affairs — more specifically, it is a policy of opposition to European colonialism in the Western Hemisphere, with Washington assuming the role of lead rallying defender. The doctrine was delivered first as part of a speech (part of James Monroe’s State of the Union Address in 1823), not a formal policy letter, and the speech was directed at the Russians — a mere 40 years after the founding of the United States itself. While it formally opposed European colonialism in the Western Hemisphere, it also did not reject existing claims. It established a grandfathering of colonial claims: new claims would be resisted directly, and successful independence movements in the New World would not be interfered with. By 1823 the United States had not established clear naval supremacy to the level required to proactively enforce the Monroe Doctrine, but Washington did have the military capacity to make European adventurism in the New World unprofitable anywhere, and more importantly to the European calculus, the budding economy of the new American nation had enough capacity to outproduce any given individual European power if fully recruited in a time of war. With the Europeans lacking a way to subvert new American territories to create organized and sponsored overt opposition to the United States, the default hegemon of the Western Hemisphere became Washington. This is an incredibly powerful position, but, as before with the relationship between the Mississippi Drainage Basin and the shipping routes out of the Gulf of Mexico, the power inherent in this position would not be fully realized until the United States established global naval supremacy — a detail that was so far beyond the thinking and reasonable capacity of the day that it took 120 years and World War II to propel the United States into that position. Control of the world’s oceans gives the U.S. a number of irreplaceable and unmitigable advantages. With its primacy in the Americas assured and naval supremacy across the world’s oceans the U.S. is the most secure and insulated nation in the world in terms of military threat. Sure, another nation could attack, but no nation can possibly invade. Once the U.S. controls the “blue water”, the details of what happen across it are of no consequence to the Americans so long as no hegemon appears anywhere else. The power of this position for a major trading nation is difficult to overstate. With the U.S. having dominance over the oceans, just sitting back and not doing anything with that control promotes not just global trade, but global trade at the good graces of the U.S. Navy. In this way Washington is able to keep it in everyone’s interest to just let the status quo continue. As time has moved on the U.S. Navy’s maritime technologies have advanced by several generations, and not only that, the U.S. Navy is one of only three navies in the world that is fully drilled (the other two being the British and Japanese). The entry cost to even trying to compete with the U.S. Navy is too high for most nations to contemplate — a situation that sounds a lot less bad to those nations when they have good reasons to assume that the ongoing U.S. Naval policy of open navigation will continue. It is becoming hard to name a communications, scientific or military technology today that does not involve a satellite in some way. This is significant. If a nation’s satellite network went out for some reason quite a few things taken for granted day-to-day would suddenly be rendered inoperable. While only a few nations have the ability to reliably place large payloads in space (especially very distant or difficult to achieve orbits), several have the ability to destroy most of the things in space by causing a debris cascade (often referred to in popular press as the “Kessler Syndrome“) — even North Korea or Iran could potentially do this. These two concrete capabilities are all-or-nothing: you either get a satellite into a useful orbit or you don’t, you either kill everything in LEO or you don’t. And, obviously, killing everyone’s satellites would be considered an act of war by someone even though the act itself would wind up affecting everyone at the same time. There is a little room, though, for a third power play in space: denial of entry or re-entry from space. The American Ballistic Missile Defense system actually has this capability, though it is normally only discussed in the context of ballistic missiles. There is little technical difference between shooting down an ICBM and shooting down a launch rocket, either on ascent, in flight, or on descent. The American BMD system creates a much more powerful and selective tool for space dominance than any other nation currently has in its arsenal: the capability to act as a gatekeeper to and from space. Are there any scenarios where Washington might want to exercise this ability? Not in the near future, probably, because spacefaring in general is still quite new. It wouldn’t really have made much different to the ancient Greeks if the Japanese had complete dominance of the Atlantic and Pacific oceans for the same reason — they had not yet reached the point that such maritime control would have been relevant. American dominance in space is a tool that can be used to guide the future development of trade, colonization and commerce in space in much the same way that Washington’s naval dominance allows Americans to take the lead in trade, even when they are not the primary party engaged in a given industry. The trick here is making the entry cost to credible competition in space (especially militarized competition in space) too high for it to be judged worthwhile. This is why the Space Shuttle was sought, and also why it was abandoned in favor of deregulation of spaceflight and space development within the domestic United States. The first American imperative that delegates control and protects the economic and scientific capability of the U.S. is the same one that is being leveraged by the Americans today to guarantee that the most advanced space technologies still are developed there, whether or not NASA is in charge or even involved in the effort. Dominance is in an interesting period of filtering right now, actually. Only a handful of nations could ever hope to catch up to the U.S. in terms of dominance in this area, and all but two are either mired in regional issues or will soon be bogged down in domestic ones. The E.U. is on the verge of splitting first East/West before dissolving entirely, Russia is halfway through re-establishing regional dominance (which its imperatives mandate), France, Germany and the U.K. (along with the rest of Europe) will soon be knee-deep in a domestic and cultural correction event, China is very likely to undergo either a political upheaval or a civil war once the European market closes to it temporarily (of course, whether a civil war is the same thing as a “political upheaval” is a matter of opinion in geopolitical terms), and India would likely have its efforts shut down by the Chinese were they to begin a serious manned space program before China is already well established there. The only nations that are potentially free and capable to compete directly and uninterrupted in space are Japan and the U.S. during the near- to mid-term. It is very likely that American space companies will come to dominate this area unless the Japanese decide to engage in a major space-based energy gambit — but at the moment a Japanese space gambit seems less likely than a Japanese attempt to dominant deep-space robotics. Whatever the outcome, once the world recovers from the upcoming period of instability it is almost certain that the Americans will have established as firm a lead over spacefaring as they have over seafaring, and it is very likely that the Japanese will either be operating to a comparable standard or have chosen to take the lead in deep space construction and robotics. In a certain sense it is 1492 all over again; these issues are somewhat distant in the future and involve a number of very fast-moving and highly technical fields, but the impact on the future history of humanity is no less significant. The final imperative is a spoiling imperative: a mandate that the US prevent something from happening elsewhere instead of causing something to happen in a geographically dictated location. As long as the Americans dominate space and the oceans the quest for achievements is at an end. At this point it is in the American interest to be relatively non-interactive with the world so long as no other regional hegemons or superpowers exist. As long as powers are relatively balanced against one another across the world, Washington’s best play is to sit back and promote trade — not because it can pull shady tricks and coerce people to do whatever it wants, but because a system of free trade is the most likely way to get nations addicted to the status quo of American naval and space supremacy, and generally raise the wealth status of everyone on the planet over time. All of this is pretty awesome, of course, but only if you belong to a nation which happens to lie across the oceans from the Americas and is satisfied with being stuck on your third or fourth imperative forever. The final three imperatives of every nation are the same, so as long as no nation expands to the point of conflicting with Washington’s 6th imperative headbutting with the U.S. can be avoided. There are a few places where this predicts Russia, Chinese and Japanese conflict with the United States, and this is indeed exactly what we see. Of course, nations do not experience emotions, so one can never feel “satisfied”. That’s not how it works. Nations will always continue to struggle against one another, so the Americans must always be watchful but only intervene once things are getting unbalanced. That is their best play, anyway, whether or not the remain focused on that is another question entirely.